An ever expanding and contracting group of civil servants, students, former elementary school teachers, and crisis line volunteers form The Moving Crew’s ranks, a collection of bodies and art objects, as well as a gathering of ideas, thoughts and relationships. Cultural animation drives our projects; we investigate the implications of a society in motion, its people migrating through space and time, simultaneously rooted and displaced, forever wandering and on the way home. By examining both humorous and serious issues on local and global scales, The Moving Crew hopes to engage the public in playful, interactive art activities that loosely surround ideas of community, movement and transformation with a sensibility of profound absurdity. Through the use of inexpensive or found objects and materials, The Moving Crew invites people into a new space where the normal rules of the world do not quite apply and where the public is welcome to collaborate. 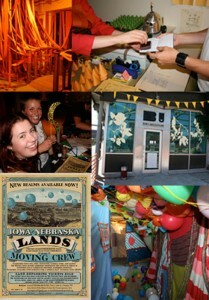 Participants in The Moving Crew’s Land-Grant-Flag-State- Construct project at the Bemis Underground in Omaha, NE entered a new realm of alternative currency, coyotes, passport office, labyrinths, caves, tunnels, fences, boat voyages, land grant offices, weather forecasts, fire insurance, Last Chance Saloon & General Store, Shantytown, fake passport making, border patrol agents and a “Make Area” where these new settlers could develop new realms of their own.